I wanted to make a basket in a Jost Amman illustration. I, myself, have met only one person (that I know of) who does basketry in the SCA and that was the Baroness who won the Persona Pentathlon 2009 in Atlantia. Basketry does not seem to be a very popular A&S item. One of my teachers for willow basketry was Sandy Whalen who lives in Milford, Michigan. I took a class from her at the 2008 Guilders Weave Convention in Newport News, VA. Making a willow basket is a lot like weaving wet saplings into a usable form. It’s incredible difficult and requires a lot of hand strengh. I made one basket and that’s all I needed to make. It cured my curiousity about why more people don’t make willow baskets. Most of the people who made willow baskets in period and later were men since such a large amount of hand strength was required. For information about the Tidewater Basketry Guild that puts on the convention, go here: http://www.tidewaterbasketryguild.org/index.html. A note about basket feet: If you look at many baskets in period art (for example Jost Amman’s pen and ink drawings of 16th century women carrying baskets), most of the baskets have “feet” to keep them up off the ground when you put them down (http://inky.library.yale.edu/medwomen/fashion.html). 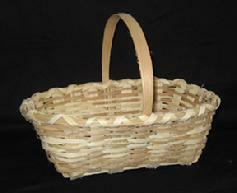 By “feet,” I mean a round base of willow that is woven separately and attached to the basket after the basket is made. I have found no instructions on how to weave these feet or attach them to the bottom of a basket. Sandy Whalen told me that there is a basket college (for lack of a better name) in Germany that teaches willow basketry and that’s one of the things they teach there, though Sandy didn’t learn that skill when she took classes there. So, until I learn how to put feet on willow baskets, I will never have that perfect German costume that I want. A second note about the baskets in Amman’s artwork: a lot of them show cross-hatched weaving. That’s another type of weaving that I haven’t seen instructions for in any book. Oak basketry is another story entirely. It is just as hard to find an oak split (or splint) basket teacher as it is to find a willow basket teacher. I learned how to make oak baskets from Claude Jenkins in a class taught in the Shenandoah National Park a couple of summers ago. There was a van of women who drove all the way from Ohio to take the class! Claude is quite a character. He could teach a class of about 25 women, tell folk tales, and split oak splits from a fresh log all at the same time. He also happens to be a “supplier of historically accurate baskets to Colonial Williamsburg” to paraphrase his business card. Claude had “apprentices” (all women) who followed him around every weekend all summer long and took classes from him. What he said about oak baskets is that you have to strip splits from a fresh log and weave them right away. This involves cutting down a tree the day before class. And not just any oak tree. Preferably a pin oak from a certain hollow in the mountains. He then debarked it, split the log up into quarters, eights, sixteenths, thirty-seconds, etc., until it was small enough, and then peeled splits with an extremely sharp knife by separating the tree rings. He could do it very quickly, of course, because he’d been doing it for decades. The rest of us had bloody fingers. The basket was easy to weave because the oak splits were fresh from the wet tree. They had the consistency similar to wet, heavily-grained, sturdy paper. Once they hardened, I had a woven basket of wood. Very sturdy. Will I ever make another one? Not likely. There’s too much work involved. I told Claude that I had ordered some oak strips from a catalog for supplies and he laughed and told me to throw them away. “They’re no good once they’ve dried out,” he said. “Even if you wet them, they’ll just splinter all over the place. You’ve gotta use fresh oak.” Since I lack the endurance/patience/fortitude/will to cut down an oak tree every time I want to make an oak basket, I think I’ll pass on weaving an oak basket again. So what does that leave? Reed. If you want to bypass historical accuracy and cost, it’s possible to find reed thick enough to mimic willow or wide enough to mimic oak. There’s no way that you’ll abuse your baskets like period users would, so I don’t think there’s any harm in substitution. As far as basket forms go, if you compare the baskets shown in period artwork to the baskets made today, there’s not much (if any) difference. Many modern basket books will show you the basics. All you have to do is adapt a pattern to the size and shape that you want to reproduce. The Medieval Health Handbook by Tacuinum Sanitatis. Translated and adapted by Oscar Ratti and Adele Westbrook from the original Italian edition by Luisa Cogliati Arano. George Braziller, New York, 1976. A resource that a lot of people told me would be useful is the SCA publication: Wetzel, Sherry, Medieval Baskets, The Compleat Anachronist, Vol. 77, The Society for Creative Anachronism, Milpitas, CA, January 1995. Wetzel has a nice grid in the article about harvest times for materials and drawings of many of the basic forms that you’ll find in period illustrations. The two books that I found invaluable in my research were Bobart and Wright’s. I can’t say enough about the historic material in these books. Wright, in particular focuses on willow basketry. => Bobart, H. H., Basketwork Through the Ages, Oxford University Press, London, 1936. => Wright, Dorothy. The Complete Book of Baskets and Basketry, David & Charles, Redwood Press Ltd., Great Britain, 1992. A modern book that will help a beginner is Lyn Siler’s The Ultimate Basket Book, Sterling Publishing Co., Inc, NY, 2006. Appalachian White Oak Basketmaking by Rachel Nash Law and Cynthia W. Taylor. 1991. University of Tennessee Press / Knoxville. 1991. I have the 3rd edition from 2001.